Do you know someone who is not lucky enough to live in the Finger Lakes? I feel for them. But aren’t we the fortunate ones? One reason I know I am lucky to live in the Finger Lakes are the opportunities to buy locally grown and made foods all year round. There are so many Farmers’ Markets, small garden stands, pick your own strawberry farmsteads and other fruit ven ders. But one of my favorite “off season” spots is New Hope Mills, 181 York Street, Auburn. My mother and I ventured out one afternoon and really enjoyed ourselves. We stocked our pantries with all sorts of edible goodies and found some Holiday gifts and stocking stuffers. Since we were there too late, we did not try any pancakes and other breakfast treats. The café is open Monday – Friday from 8 – 3:30 and Saturdays from 10 am – 1:30 pm. Fridays from 8 am – 1 pm it is All-You-Can-Eat-Pancakes for the amazing price of $3.99. We did sample the doughnuts however. While she lives in an apartment now and has meals prepared, my mother still likes to invite friends over for afternoon tea time offering tasty and nutritious snacks and good jams and jellies and nut spreads on smeared on yummy crackers. Don’t tell my gal pals, but they will be getting specially selected jams for Christmas. Sue will be getting Garlic Jam while Cynthia will enjoy gluten free Peach Spread and Laura will receive Fig Preserve with Ginger. I can imagine this spread over the top of a ham during the last 15 minutes in the oven. At our holiday gathering, we will also be trying a gluten free chocolate cake layered with Raspberry jam and whipped cream. Lydia and I experimented with the Chia pancakes the other evening - a quick and tasty supper between violin lessons for her and a board meeting for me. All topped with applesauce I made some apple sauce with 5 different varieties of apples we picked up at Owen Orchards over the weekend. 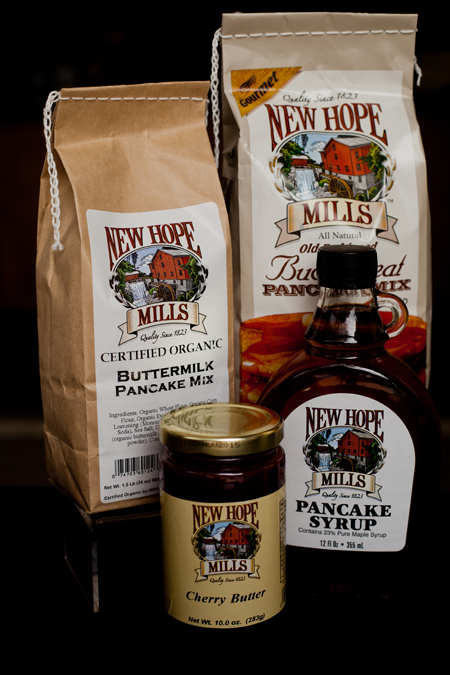 New Hope Mills also has gift packages including The Baker’s Bundle Deluxe and Breakfast for the Crew along with gluten free, organic, low carb and sugar free options plus herbs, licorice and other candy, maple syrup and soup mixes. Check out their website or, better yet, check out the shop for the entire line of New Hope Mills food.